All transactions are safe and secure with a reliable history in online purchasing behind each of our associates. 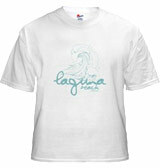 Buy the Blue Wave Laguna Beach t-shirt to own Laguna Beach clothing and merchandise. The fronts of these MTV Laguna Beach t-shirts display a light blue design that includes a cresting wave above the title of the TV series. The refreshing design captures the excitement of the beach, while at the same time maintaining its own youthful style. It's perfect for a day spent shopping on the boardwalk, or rollerblading to the music of the MTV Laguna Beach Soundtrack. In addition to the Blue Wave Laguna Beach tee above, browse the Laguna Beach Clothing Gallery for more apparel like men's and women's clothes, kids shirts or hoodies.